Giuseppe Moscati was born on 25 July 1880 in Benevento, seventh of the nine sons of magistrate Francesco Moscati and Rosa De Luca, of the Marquesses of Roseto. He was baptized on July 31, 1880. In 1881 the Moscati family moved to Ancona and then to Naples, where Giuseppe made his first communion on the feast of the Immaculate Conception of 1888. From 1889 to 1894 Giuseppe completed his secondary studies and then the high school students at the "Vittorio Emanuele". with high marks the high school diploma in 1897, at the age of just 17 years. A few months later, he began his university studies at the medical school of the Neapolitan University. It is possible that the decision to choose the medical profession was partly influenced by the fact that during the adolescence Giuseppe was confronted, in a direct and personal way, with the drama of human suffering. In 1893, in fact, his brother Alberto, lieutenant of artillery, was brought home after suffering an incurable trauma following a fall from a horse. For years Joseph lavished his caring care on his beloved brother, and then he had to experience the relative impotence of human remedies and the efficacy of religious comforts, which alone can give us true peace and serenity. However, it is a fact that, from an early age, Giuseppe Moscati demonstrates an acute sensitivity to the physical suffering of others; but his gaze does not stop at them: it penetrates to the last recesses of the human heart. He wants to heal or soothe the wounds of the body, but he is, at the same time, deeply convinced that soul and body are one and ardently desires to prepare his suffering brothers for the saving work of the Divine Physician. On 4 August 1903, Giuseppe Moscati graduated in medicine with full marks and right to the press, thus crowning the "curriculum" of his university studies in a worthy way. Five months after graduation, Dr. Moscati takes part in the public competition held for the office of ordinary assistant in the Riuniti Hospitals of Naples; almost simultaneously he is supporting another competition for extraordinary coadjutor in the same hospitals, based on tests and titles. In the first of the competitions, out of twenty-one ranked, he succeeds second; in the other he succeeds first absolute, and this in such a triumphal way that - as one reads in a qualified judgment - "amazed examiners and comrades". Since 1904, Moscati has been serving as a coadjutor at the Hospital of the Incurabili, in Naples, and among other things organizes the hospitalization of those affected by rabies and, through a very courageous personal intervention, saves the patients in the hospital of Torre del Greco , during the eruption of Vesuvius in 1906. In the following years Giuseppe Moscati obtained the suitability, in a competition for exams, at the laboratory service at the infectious diseases hospital "Domenico Cotugno". In 1911 he took part in the public competition for six posts of ordinary help in the Ospedali Riuniti and won him in a sensational way. The appointments are made to ordinary coadjutor, in hospitals and then, following the competition for ordinary doctor, the appointment as director of the room, that is to primary. During the First World War he was director of the military departments in the Riuniti Hospitals. This hospital "curriculum" is flanked by the different stages of the university and science: from the university years until 1908, Moscati is a volunteer assistant in the physiology laboratory; from 1908 onwards he is an ordinary assistant in the Institute of Physiological Chemistry. A study place in the zoological station follows for the competition. Following this, he was nominated as volunteer preparator for the III Medical Clinic, and in charge of the chemical department until 1911. At the same time, he covered the different levels of teaching. In 1911 he obtained, for titles, the Free Teaching in Physiological Chemistry; has the task of leading scientific and experimental research in the Institute of Biological Chemistry. Since 1911 he has been teaching, without interruption, "Laboratory investigations applied to the clinic" and "Chemistry applied to medicine", with practical exercises and demonstrations. On a private basis, during some school years, he teaches numerous graduates and students in hospital, clinical and anatomy-pathological semeiology and casuistry. For several academic years he completed the substitution in the official courses of Physiological Chemistry and Physiology. In 1922, he obtained the Free Teaching in General Medical Clinic, with dispensation from the lesson or from the practical test to unanimity of votes of the commission. Famous and sought after in the Neapolitan environment when he is still very young, Professor Moscati soon won a reputation of national and international importance for his original research, the results of which are published by him in various Italian and foreign scientific journals. This pioneering research, which focuses mainly on glycogen and related topics, assures Moscati a place of honor among the medical researchers of the first half of the century. However, it is not solely or even principally the genius skills and resounding successes of Moscati - its sure innovative methodology in the field of scientific research, its diagnostic out of the ordinary glance - that arouse the wonder of those who approach it. More than anything else is his own personality that leaves a profound impression on those who meet him, his limpid and coherent life, all imbued with faith and charity towards God and men. Moscati is a first-rate scientist; but for him there are no contradictions between faith and science: as a researcher he is at the service of truth and truth is never in contradiction with himself nor, much less, with what the eternal Truth has revealed to us. The acceptance of the Word of God is not, moreover, a simple intellectual, abstract and theoretical act for Moscati: for him faith is, instead, the source of all his life, unconditional acceptance, warm and enthusiastic. of the reality of the personal God and of our relations with him. Moscati sees in his patients the suffering Christ, he loves and serves him in them. It is this impulse of generous love that impels him to give himself without pause for those who suffer, not to wait for the sick to go to him, but to look for them in the poorest and most abandoned districts of the city, to take care of them free of charge, or rather, to help them with his own earnings. And all of them, but in a special way those who live in misery, perceive the divine strength that animates their benefactor. Thus the Moscati becomes the apostle of Jesus: without ever preaching, he announces, with his charity and the way in which he lives his profession as a doctor, the Divine Shepherd and leads to him the oppressed and thirsty men of truth and goodness . As the years progress, the fire of love seems to devour Giuseppe Moscati. The external activity grows constantly, but his hours of prayer are prolonged and his encounters with the sacramental Jesus are progressively internalized. 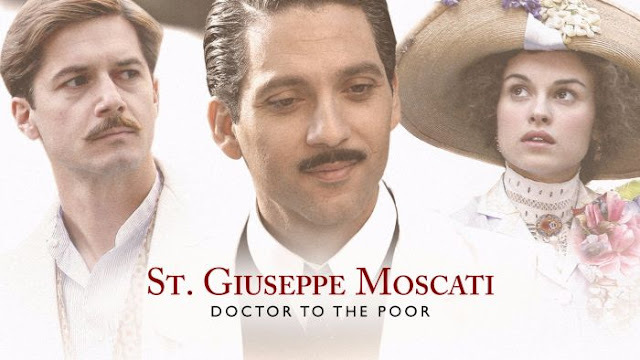 When, on April 12, 1927, Moscati died suddenly, struck down in full swing, at the age of 46, the news of his death was announced and spread by word of mouth: "The Saint Doctor died". These words, which sum up the whole life of the Moscati, today receive the official seal of the Church. Prof. Giuseppe Moscati was beatified by St. Paul VI during the Holy Year on November 16, 1975. St. Guiseppe, let us pray for all interns beginning residency this year. May we have courage and humility as we learn to become compassionate physicians. O Saint Joseph Moscati, doctor with a huge heart, in the exercise of your profession you cured the body and spirit of your patients, turn towards us too who now run to you with faith in your intercession. Give us physical and spiritual health, so that we can serve our brothers with generosity. Alleviate the pain of those that suffer, give comfort to the sick, consolation to the afflicted, and hope to the hopeless. Make that the sick might encounter doctors like you: human and Christian. The youth find in you a model of life, the workers, an example, the old, comfort, and the dying, hope in eternal salvation. Be for all of us a sure guide: teach us to work with serenity, honesty and charity, to be able to complete in a Christian way our everyday tasks. Lord thou great physician, we kneel before thee. Since every good and perfect gift must come from thee, we pray: Give skill to our hands, clear vision to our minds, kindness and sympathy to our hearts. Give us singleness of purpose, strength to lift at least part of the burden of our suffering fellowmen, and a true realization of the rare privilege that is ours. Take from our hearts all guile and worldliness, that with the simple faith of a child, we may rely on thee.